Biblical Age Earth – What is the Biblical Age of the Earth? How does anyone know? What data suggests or confirms dates? There is a great debate between evolutionary thinkers and creationists, as to the age of the earth. If you believe in creation, you can find data to estimate the age at less than 10,000 years old based on births and deaths revealed in the Bible. If you believe in an explosion resulting in order and evolution, the age is over 4 billion years by most estimates. In this case, you would have to argue there was death before sin, and most scientists deny the biblical flood. The argument that the earth is billions of years old became popular within the last 200 years. Prior to the early 17th century and late 18th century most people believed the biblical age of the earth was about 6,000 years, as recorded in the Bible. They took God’s word as truth. 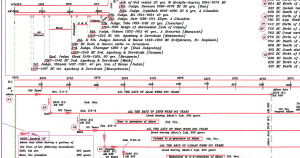 Ray Campbell used research data and biblical genealogy data, cleverly input into a survey application, to produce this biblical timeline from Adam to Jesus, from who’s birth we know fairly well how long it’s been to today. Therefore it us useful evidence to argue a biblical age of the earth. Download Free Timeline » It may be printed off a thumb drive or smartphone at any local printer. Print at “Blue Print” size, or select actual size. If you would like to Donate » , 90% goes to Ray Campbell who input data in application, 10% to site maintenance.